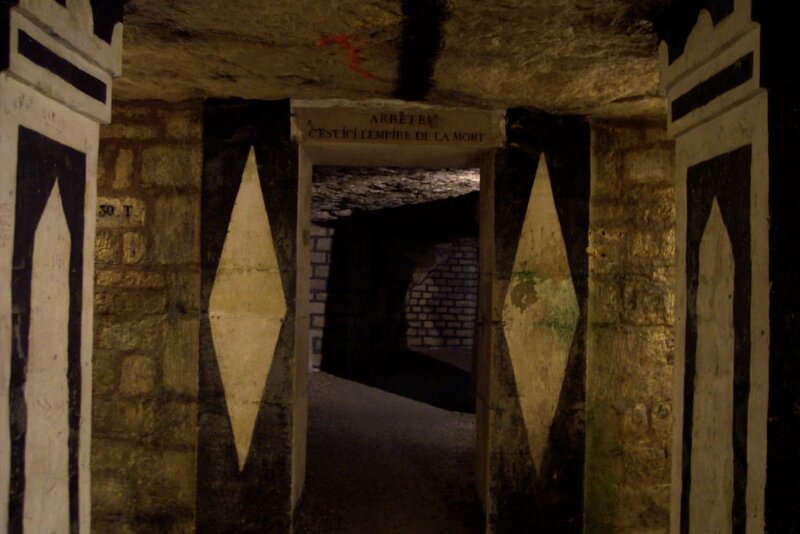 The walking tour takes you through a small portion of the old limestone quarries in the 14th arrondissement. In one disturbingly large section, there are piles and piles of human remains that were excavated because they were contributing to groundwater contamination close to the river. If there is such a thing as an 1800s tourist trap, this is certainly it. The whole thing is set up to be gruesomely entertaining, with a nod toward the fact that you're walking through a mass grave of sorts. The entrance, as seen to the right, is dramatically marked with white diamonds on a black background. Over the doorway, all-capital-lettered French words announce ominously, "Stop! This is the empire of the dead." Like the other tourists around us, we all read the sign aloud in a foreboding voice to the rest of our party and translated it as appropriate. The urn in the front used to have a flame burning in it constantly. No, it wasn't an eternal flame à la JFK, but a fire designed to keep air moving through the quarry tunnels. Functional, not reverent. The other amazing observation for me was to see how high the bones are stacked. (Colin, who is 6'2", is standing next to a typical wall of bones in the photo below.) The statistics say that there are somewhere between 6 and 7 million people down there! And, we only saw a small portion of it. It made me a little sad, knowing that these were all parts of unique individuals who are now reduced to a macabre display for the entertainment of tourists. Despite my cynicism in reporting, I enjoyed this tour. I think it's worth the time, but I wouldn't put it on the "must see" list for someone's first time to Paris. When we were in the regular quarry tunnels (sans bones), I had pleasant flashbacks of my caving days in graduate school. (If you're a caver, rest assured that this is completely cush caving! No mud, no water crawls, and definitely no pretties!) Colin noticed that teeny little soda straws are starting to form on the ceiling of parts of the quarry tunnels, just like they do in the limestone caves back in Missouri. Of course, anything that gets to a decent size will break off as soon as someone over 5'10" tall walks by, but I don't think that the tourists are ever going to visit just to see the stalactites! Let me just add one little thing. 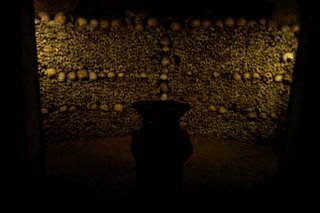 I agree that the number of bones in the Catacombs is absolutely unfathomable. For example, take the picture with me, then imagine that section repeated over and over again for about 800 meters. 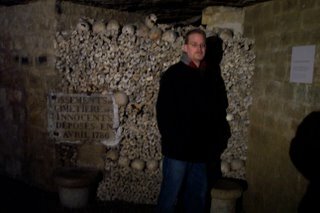 Okay, now you can imagine (maybe) the very small portion of the ossuary that is on the tour. Yikes. 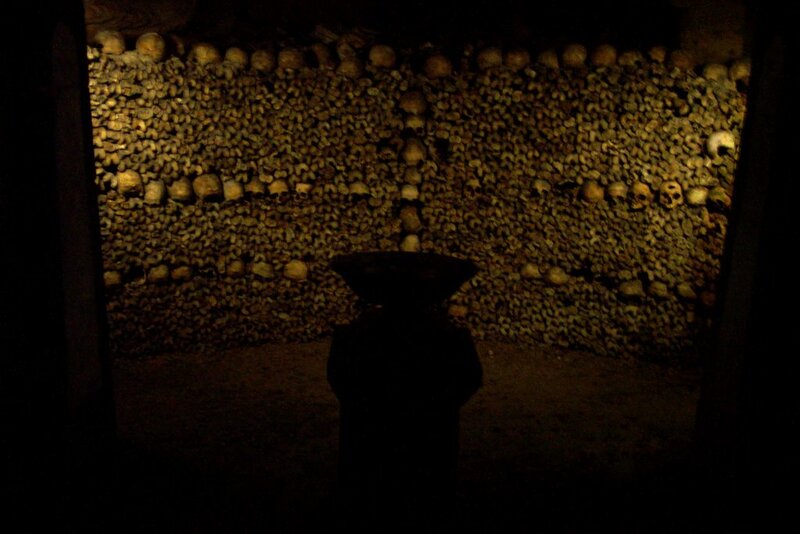 1) The Catacombs have been an organized tourist attraction for something like 150 years. 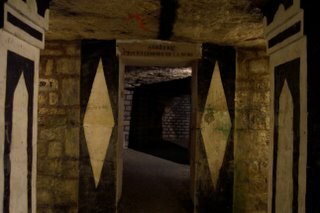 3) The quarries that the catacombs are part of date from the Roman occupation of Paris. The Romans arrived in 52 BC; all of the other surviving buildings from that period date from the 2nd century AD. In other words, we were walking in underground quarries that are nearly 2 millenia old! I'm so glad that you didn't take Didge. I'm sure it would have made a "strong impression" on him!